February, Friday 20. 1885 Recd Int from Wm T Kennedy $26.70 Pd Pigs feet .70 Pd Alcohol .45 Pd Oranges & fish .55 Pd Paper .10 2 men 1/2 day (4h) each Saturday 21. Pd Marketing & Groc. 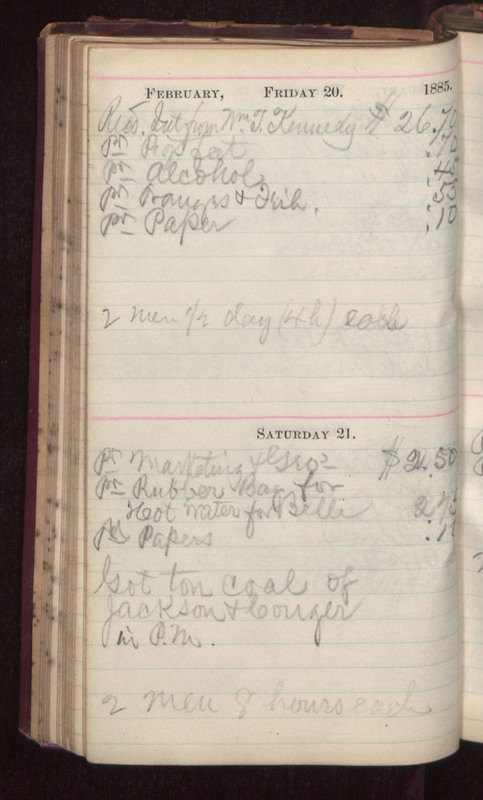 $2.50 Pd Rubber Bay for Hot Water for Belli 2.75 Pd Papers .10 Got ton coal of Jackson & Conyer in P.M. 2 men 8 hours each.